This brass cuff is hand-cast from real birch bark collected along the southern shore of Lake Superior. You can almost hear the rustling of leaves on a summer day as you don this nature-inspired cuff. Jewelry artist Nancy Nelson hand casts the brass band from real birch bark that she collected along the southern shore of Lake Superior in Wisconsin. The detailed texture of the bark evokes the rich, spontaneous stroke of an artist's brush. The understated heart cut-out pairs beautifully with the birch tree's traditional symbolism of protection and resilience. Handmade in Maryland. 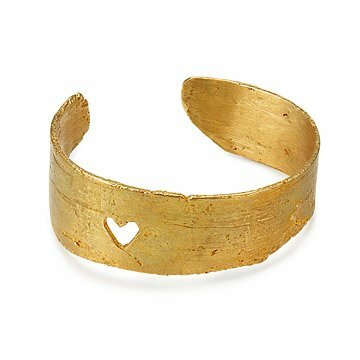 Click here to see the custom love birch cuff, with engraving available for two sets of initials. Nice cuff, but it leaves a gray/green color on the wrist. Wife really liked it. It will go into her regular rotation. The Bracelet was beautiful and stunning! My wife loved it and was very excited because of it's uniqueness. I scored major points for this purchase! I highly recommend. Great delivery time, boxed well. Its the type of box she'll save. Wears it all the time. I love this bracelet. I love the story. I love the sentiment. I love the delicate way it was packaged. It's definitely unique and I get many compliments. Another huge bonus: I have really small wrists and it is easy to resize, which I always worry about. The only thing I would caution anyone about is that the bracelet is not as yellow gold as it appears in the photo. It's gold, but more muted. If I used words to describe the color I would say it's halfway between yellow gold and white gold, but that description is in no way a comment on the metal. I wish it were more yellow gold to match some of my other jewelry, but it's so far away I don't think it will matter.